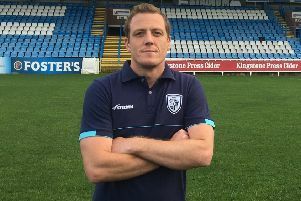 Ben Reynolds, who scored Featherstone Rovers' only points against Toulouse with a penalty. In a Betfred Championship game played in difficult conditions the home side scored the only try to maintain their winning run with Rovers' only points coming from a Ben Reynolds penalty. Featherstone led 2-0 at half-time, but were unable to add any further points after the break on a raid sodden pitch. The low score gave a good indication of how difficult both teams found it in muddy conditions that made the ball like a bar of soap, although they tried to play. After the tryless opening 40 minutes it was Toulouse who finally found their way over the line three minutes into the second half when Tyla Hepi powered over. The conversion by Mark Kheirallah made it 6-2. Kheirallah stretched the lead by a further two points when he landed a penalty on 55 minutes and that proved the end of the scoring. Rovers did have a chance in the last 10 minutes when half-back Reynolds put a grubber-kick in behind the home defence, but the chasing Josh Walters looked to be impeded and the opportunity came to nothing. Scorers - Toulouse: Try Hepi; goals Kheirallah 2; Featherstone: Goal Reynolds. Toulouse: Kheirallah; Maurel, Ader, Jussaume, Marcon; Ford, Barthau; Santi, Parata, Boyer, Mika, Curran, Marion. Subs: Bell, Puech, Hepi, Dezaria. Featherstone: Golding; Briscoe, Walters, Harcastle, Newman; Richardson, Reynolds; Ormondroyd, King, Makatoa, Davies, Day, Lockwood. Subs: Cooper, Wheeldon, Harrison, Render.